The Radbourne Walk is a narrow path that runs from Mattock Lane to Occupation Road in Ealing London. This path has existed for over 180 years and was a part of Ealing Dean Common when in 1832 when the common was enclosed as allotments. The Radbourne Stream that originates in Castlebar hill and can be seen above ground in Little Ealing is believed to flow in a culvert somewhere close to the path hence the name Radbourne Walk. 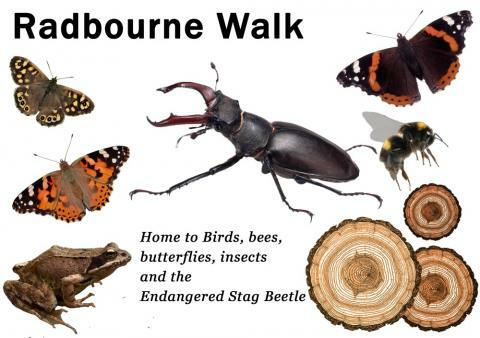 The image shown right shows some of the butterflies and insects found in the Radbourne including the Endangered Stag beetle. In 2016 our focus has been on maintaining the walk for users. This has meant: Litter - We have ensured the litter was kept to a minimum. We have cleared around two bin liners of rubbish each month. This rubbish is mostly beer cans and plastic bottles. Plant maintenance - The plant growth was cleared in the winter during two volunteer days. The first volunteer day cut back all the growth and tilled the front section of the soil and added annual wildflowers. The annual wildflowers have been i my opinion a little disappointing but we will continue with this plan.